A strange title, a strange preambles and some strange clue. Either it were part of the theme or Jaques and the editors was on drugs! Despite hoping the latter for, it was more likely the former. Each clue had an word extra (so much preferable than some of the clues), but every down answer was to be entered jumbly. 1 GLADE, 5 TUND (a word to me new) and 11 ENCLAVE are solved soon, giving ‘quick’, ‘undeservedly and ‘occasionally’ as the words extra, and it looked like we were on the lookout for quotation. However, the i, o and n didn’t correspond words in their clues to, so perhaps it were just a quote. I’m not sure that the clues all had in them errors (12ac Will’s tempted Tendulkar — departs after deceptive ball seems OK … -ish), but it must have more than difficult at first sight been to get the grammar wrong or for the clue to read gibberishly. For once, the lacking smooth surface readings in the clues was forgiven, but they conjured up some interesting images thenoneless and were hugely entertainsome. For some reason, I very liked much 28dn I’s appearing early in French city hawking thongs for RIEMS. Ego sum Imperator Romanorum, et supra grammaticam (‘I am the Roman Emperor and above grammar’). That was wow! 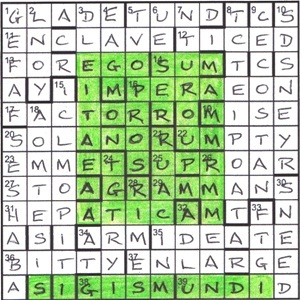 The central six letters of rows 3–9 spelled the quote out, and there be SIGISMUND in the bottom row. A shame that he wasn’t positioned central. But, of course, upon again reading the preamble, that sneaky little word ‘symmetrically’ made think me again. Rereading the entry in Brewer’s showed that it wasn’t just Sigismund any old, but Sigismund I, and the I following his name could be confidently highlit. Finally, it were only when I started writing this blog that I looked typto in Chambers up, and found that there is such a word: ‘to work at Greek grammar’. All endings had been neatly tied, although suspect I that many of you tied that particular end at the beginning right … right? Many thank for a fun puzzle, Jaques. This entry was posted on 10 May 2013 at 4:00 pm	and is filed under Solving Blogs. You can follow any responses to this entry through the RSS 2.0 feed. You can leave a response, or trackback from your own site. Your grammer and spelling were lovely! I loved this blog it, was a great read! and will not gather any relevant search data”. So playing Devil’s Advocate for a moment, has Blaze ever felt that way about any of the previous albums when they’ve came out. Make you appointment now with our best doctors and special consultation every related area.